you're always in the same place. Tuesday, caught monsters vs aliens with vell. Hangout awhile before i went to find nigel and boonchew to chill at cathay starbucks. 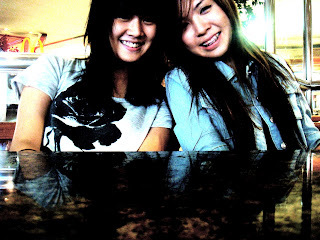 Wednesday, had dental in the morning/lunch with sister while waiting for vell. Shop around after sissy left. Headed for dinner as eka's mum invited us prego restaurant at raffles. There were together six of us.. Earlier on at the dental clinic: "I hope you didn't plan a good lunch/dinner today." said Dr lee. Well i initially ordered aglio olio but i could hardly even bite so i ended up drinking mushroom soup instead and gave my food to them, lololol. Supposed to go hollandv to find some friends, but drop the idea as it was getting late. Thursday, i'm supposed to accompany andy to nuh in the morning, but.... Hahaha so sorry man! I'll catch you soon since our plans for friday is cancelled :( Anyway stayed home the whole day! Friday, out in the afternoon, went to eka's and jon's camp carnival, totally retarted, its quite boring there! Headed to town, had dinner and caught terminator and homed cause eka's leaving for aussie and leo is accompaying gab for his s.idol audition tomorrow, all the best then!